Whatever the outdoor activity—from gardening to going on safari— Fite Bite permethrin clothing spray is the perfect insect repellent for your clothing, nets, tents, and gear. When applied to fabric, permethrin will repel or kill mosquitoes, ticks, chiggers, and mites. 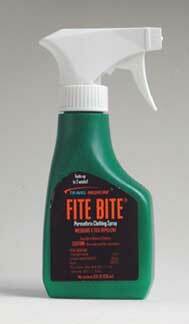 Permethrin spray (0.5%) is currently available in two forms: Fite Bite Permethrin trigger spray in an 8 oz. nonaerosol trigger spray and Repel Permanone in a 6 oz. ozone-safe aerosol. A 6 oz. container of permethrin will treat two complete outfits (shirt, trousers, and socks).